The organists below are our volunteer house organists. They play the organ every Friday and Saturday before the evening shows and on some Sundays and holidays. Many of them will be featured in our year end party on New Years Eve. Most of our organist are members of SLTOS, the St. Louis chapter of ATOS. If you like organ music you may find out more about these groups by clicking on their names. Dave Stephens has played every Friday night for over 6 years. Dave, a baker by trade, displays his keyboard skills before the shows almost every Friday. Larry Krupp: Telephones are his work and making beautiful music is the hobby he shares with us. Mark Gifford is the Associate Pastor of Parkway Christian Church, Springfield IL and a recording artist. 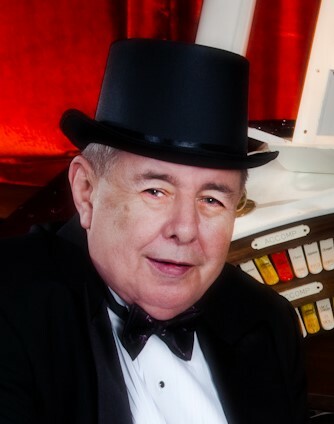 Mark is featured in the Lincoln's first CD "Pipe In A Swingn' Christmas". Fran Ettling: A teacher by day but by night she is known for her keyboard skills. Bob Heil: High Tech Heil is know the world over for his sound skills but you can really hear his sounds at the Lincoln's pipe organ. Jack Jenkins: Music has always been a part of Jack's life and we are glad he continues to share it with us. In remeberance of Ken Iborg. He was a good friend to the theatre.